Klipfolio is a popular cloud app for chart and dashboard creation. 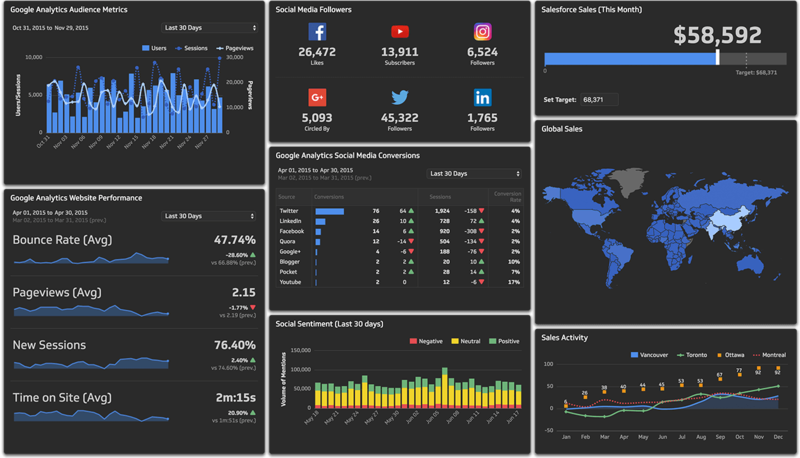 It addresses the needs of many small and medium size businesses that simply want a visual representation of their data, and comes with over a hundred data connectors, pre-formed charts and dashboards, and follows the 80–20 rule: 80% of needs can be met by 20% of the effort. In other words it does the simple things very well, and comes to a grinding halt as things become more complex. However, don’t let this put you off – most business needs are not all that complex. Very easy to use for simple needs. API connector for services where a pre-built connector is not available. Easy to embed charts and dashboards into other applications. If you have sophisticated needs this is not the platform for you. Things get complicated very quickly as needs become more complex. Steep learning curve for other than the simplest charts and dashboards. As with most products of this nature, the promise of dragging a few icons around and hey presto your charts and dashboard needs are met, is misleading to say the least. For very simple needs Klipfolio is easy to use. However, customers very often comment how steep the learning curve is, particularly for complex real-world needs. Klipfolio make it as easy as possible to connect to a wide range of database, services and files (CSV), and then merge the data to produce meaningful charts. An extensive gallery of pre-built metrics and data visualizations are available in the Klip Gallery. However for bespoke needs users employ the Klip Editor. This supports the use and creation of functions, logic and formulas, and combine multiple data sources. The data preparation capabilities are rudimentary, but adequate for many needs. The sharing of dashboards is a major feature, and distribution of reports and dashboards can be scheduled as needed. There is a lot of competition in this space, and so Klipfolio needs to address common needs at a competitive price – which is exactly what it does. Competitors include ClicData, Plecto, Power BI and Grow.